Sir, as a minister of state in the Nigerian aviation industry, what is your take on the performance of this present administration in almost four years? As you know, aviation as a globally-regulated industry; any lapse in one state is clearly monitored and exposed by the others. In Nigeria, under the present administration headed by President Muhammadu Buhari, much achievement has been recorded in the sector and these are verifiable. To succinctly put it, aviation achievements under President Buhari is unprecedented. They are not hidden. One of the major achievements of this administration is the sustenance of safety, which has been phenomenal. It is on record that since this administration came onboard, there is has not been an accident to commercial airlines, which has further boosted and restored confidence of the flying public. However, this achievement would not have been attained without the strong regulatory function of the Nigerian Civil Aviation Authority (NCAA). Under this present administration, the country’s air travel has enjoyed huge safety record, which is tremendous. The Ministry has recorded significant achievements in virtually all aspects of the sector in the past three years as follows: Growing and Sustaining the Domestic Aviation Industry; Re-introduction of zero import duties on aircraft, engine and introduction of same for spare parts. Intervention to rescue Arik Air and Aero Contractors from total collapse is another milestone, which would have led to the demise of the two airlines and cause huge loss of jobs by professionals in the sector. The two airlines are today still in operation, under receivership. Just last December, this government through the approval of President Buhari paid 50 per cent of severance and retirement benefits to 5,966 staff of the former national carrier, Nigeria Airways. The beneficiaries even held a ‘thank you’ rally to appreciate President Buhari for walking the talk. You will recall that the airline was liquidated in 2003 and since its liquidation, several ministers and governments in this country refused to pay them their severance packages, which I think was bad for the system. 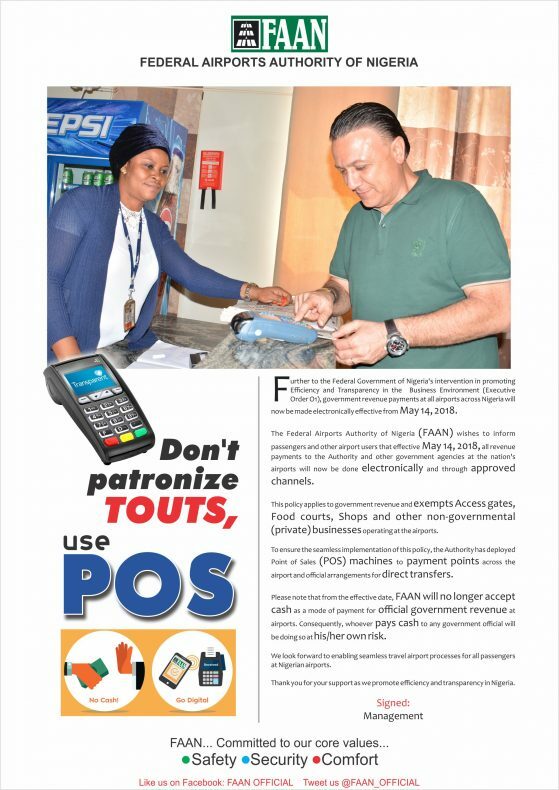 You don’t treat your citizens bad and expect the younger ones to put in their best into the system, but President Buhari ensured that they were paid part of their benefits. I can however assure you that the remaining balance would be paid as promised. Besides, this administration has ensured a safe and competitive aviation industry resulting in the growth of the sector. The sector recorded an average growth of 33 per cent on domestic operations and 13.5 per cent on international operations between January, 2017 to June, 2018. This is also unprecedented in this country. Also, we provided the enabling environment for domestic airlines in the country to attain certification in the IATA Operational Safety Audit (IOSA). Currently five Nigerian domestic airlines have Certification, while we also designated some of them for international operations. What is your say on safety and security in the sector in the past three years? The certification of Murtala Muhammed International Airport, (MMIA) Ikeja, Lagos in April, 2017 and Nnamdi Azikiwe International Airport, Abuja in November, 2017 was a milestone and the first ever Airport certification in Nigeria for that matter. Let it be known that the certification of the two airports by NCAA placed Nigeria on the pivotal of aviation on the continent as no country in Africa has two of its international airports certified. Also, the certifications of Kano and Port Harcourt Airports have reached advanced stages and would be achieved this year. Also, this administration promulgated the new Nigerian Civil Aviation Regulation, which took effect in July, 2016. Nigeria achieved an effective implementation level of 67.36 per cent during the recent International Civil Aviation Organisation (ICAO) Universal Safety Oversight Audit Programme carried out in March, 2016, which is above global average of 63.54 per cent. Nigeria also recorded 96.45 per cent in ICAO Universal Security Audit. In the areas of State Safety Programmes, Nigeria has attained Level 3 out of 4 levels, thereby moving Nigeria from red to green on the ICAO dashboard. In line with ICAO and WMO standards, in July 2017, the Nigerian Meteorological Agency acquired ISO 9001 2015 certificate, which qualifies it to offer aeronautical meteorological services. The agency became the first in Africa to be so certified in that category. What has the administration done in the area of navigation aids across the airports? We have completed the Kano Tower Automated Air Traffic Management and Meteorological Systems, installed the Instrument Landing Systems (ILS) Category II (CAT II), Doppler VORs (DVORs), Distance Measuring Equipment (DMEs) at four airports; Lagos, Kano, Port Harcourt and Kaduna completed, while that of Minna, Jos, Yola, Maiduguri, Benin and Akure are still on-going and nearing completion. You will also recall that almost two years ago, the Nigerian Airspace Management Agency (NAMA) Installed CAT III Instrument Landing System in Lagos and Abuja, which has helped in great deal to improve operations during inclement weather conditions. Also, we have installed the Very High Frequency (VHF) radios for aerodrome and approach air-ground communication in 18 airports nationwide. The airports are Maiduguri, Enugu, Jos, Calabar, Yola, Ilorin, Sokoto, Lagos, Kano, Abuja, Port Harcourt, Ibadan, Zaria, Katsina, Owerri, Yola, Calabar and Kaduna. Besides, we have installed the high power Very High Frequency (VHF) stand-alone radios in Lagos and Kano Area Control Centres (ACC) as backup for air – ground upper airways voice communication and we also embarked on the deployment of Controller-Pilot-Data Link Communication (CPDLC) in Lagos and Kano to enhance communication in the oceanic region and the remote areas of the north. Commencement of Aeronautical Information Management Automation Project, which comprises a network of 26 VSAT facilities at all Nigerian airports as well as Search and Rescue (S&R), with coordination domiciled in Lagos. This will enable Nigeria to comply with the mandatory transition from Aeronautical Information Service (AIS) to Aeronautical Information Management (AIM). We also developed and published Performance-Based Navigation (PBN) Procedures for 18 airports across the country and also introduced Standard Instrument Departures (SIDs) and Standard Arrival Routes(STARs) at Lagos, Abuja, Kano and Port Harcourt as an improvement on the procedures. You just enumerated the achievements of the administration in airport development, deployment of navigational aids and others, what investment have you carried out in NiMET in recent years? The certification of the Nigerian Meteorological Agency (NIMET) for conformity with the requirements of ISO 9001 2015 in the provision of meteorological services to the aviation industry and other user- sectors is a major achievement of this administration in the sub-sector. NiMET today is the only meteorological agency in the entire Africa continent to achieve the 2015 version of this programme. The agency is also collaborating with national and international organizations to improve weather and climate services delivery in Nigeria. With its present status, farmers and other sectors now rely on the forecasts of NiMET for planning of their activities. As you are aware, NiMet provides daily weather forecast to Liberia and Sierra Leone and currently training meteorological personnel from the Republic of Gambia in Banjul. NiMet has entered into strategic partnerships with Met Agencies of Korea, Finland and India with a view to developing our capacity to design and fabricate automatic weather equipment and meteorological satellite system. It has also installed Low Level Wind Shear Alert System (LLWAS) at Katsina, Ilorin and Kaduna Airports. We have also completed the modernisation of NiMet forecast office and construction of zonal office at Mallam Aminu Kano International Airport (MAKIA), Kano and installed Tidal gauge at NiMet Marine Station in Eket, Akwa Ibom State. Besides, we have constructed additional hydrogen gas generation building and remodelled synoptic offices at Lokoja Station and Gombe. We have also continued with the Doppler Weather Radar project, which was started in 2007, but abandoned. The weather radar systems will soon be commissioned in Kano, Lagos, Port Harcourt, Abuja and Yola. This is not forgetting the fact that we have undertaken rehabilitation of several meteorological enclosures, recording equipment, forecasting facilities and associated infrastructure nationwide to enhance weather recording and use in support of safe air navigation. In June 2018, NiMet’s Regional Training Centre got full re-accreditation by the World Meteorological Organisation (WMO) to continue offering courses for meteorological personnel from West, Central and North Africa. How has the Accident Investigation Bureau (AIB) performed under your leadership in recent time? You will recalled that Vice President Yemi Osinbajo and 11 others were involved in a helicopter crash managed by Caverton Helicopter in Kabba, Kogi State and few hours after the accident, Accident Investigation Bureau (AIB) vowed that it would publish the preliminary report in few days. True to its word, in less than two weeks, AIB came out with the preliminary report on the accident and this singular action received applauds from all stakeholders including Aviation Round Table (ART). Gone are the days when we would wait endlessly to know what happened in aircraft accidents and incidents; the bureau is adequately funded to investigate any major incident or accident and it recently signed a Memorandum of Understanding (MoU) with the Sao Tome and Principle. It has also gone beyond the shores of Nigeria to investigate major incidents, which happened in other country. AIB has published 10 final reports on serious incidents out of 28 released since the creation of AIB in 2007. This indicates 36 per cent of total reports released by the bureau since it was established in 2006. It has even Issued 39 safety recommendations out of a total of 121 issued by the agency. Again, this represents 32 per cent of total safety recommendations ever released by the agency. This administration has also rehabilitated the Emergency Operating Centre and furnished the Resuscitation Centres at Abuja and Lagos Airports, respectively. What is the government doing on the commissioning of other airports under construction? 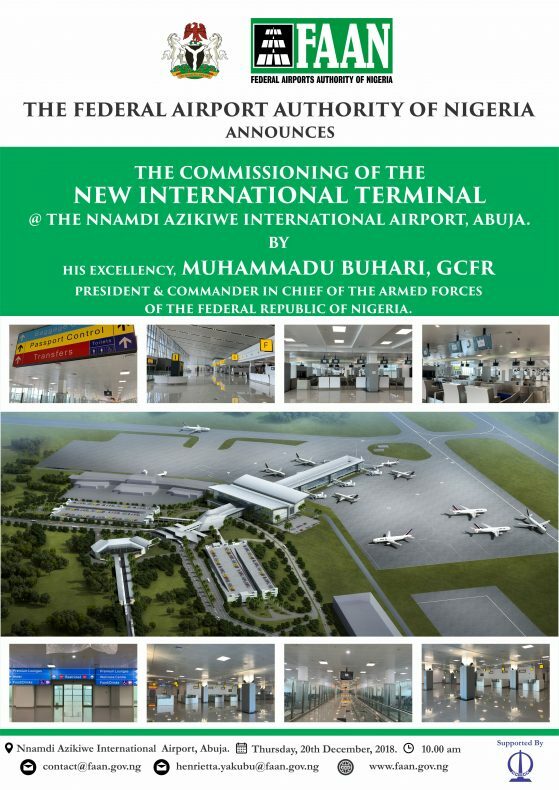 On airport development, President Buhari has commissioned the Port Harcourt International Airport, Omagwa and the Nnamdi Azikiwe International Airport, Abuja and passenger facilitation has since commenced at these airports. This administration met the projects on ground, but Mr. President ensured that they were not abandoned. At present, Kano and Enugu airports are at advanced stages of completion. We reconstructed Abuja runway and undertook isolated repair of the taxiway and apron, including complete remarking of the entire pavement and associated airfield lighting system. We streamlined various security screening points at the international airports in line with Executive Order on Ease of Doing Business. This government also installed solar airfield lighting at 10 airports; Akure, Port Harcourt, Sokoto, Yola, Kaduna, Minna, Enugu, Maiduguri, Jos and Ibadan. We also completed a 1300-capacity multi-storey car park at the international terminal in Lagos through the Public Private Partnership (PPP) and the construction of Wing D Terminal at Abuja Airport. What are you doing to improve on the present human capacity in the industry? You can testify to the improvement at the Nigerian College of Aviation Technology, Zaria having been there with your colleagues to be trained this January. You all saw the transformation first hand at the college. NCAT has been designated as ICAO Regional Training Centre of Excellence and it is one of the foremost institutions to be so designated on the continent. Being an ICAO Regional Training Centre of Excellence (RTCE), it means recognition by ICAO as a regional training leader, it has the right to develop and deliver ICAO Training Packages (ITP’s) in all the annexes and generation of revenue through the selling of Standard Training Packages. In the same vein of capacity development, FAAN Training Centre was designated as ICAO Aviation Security Training Centre of Excellence in October 2018 and the training centre was commissioned in December 2018.